material 100% paper board. 52 playing cards. 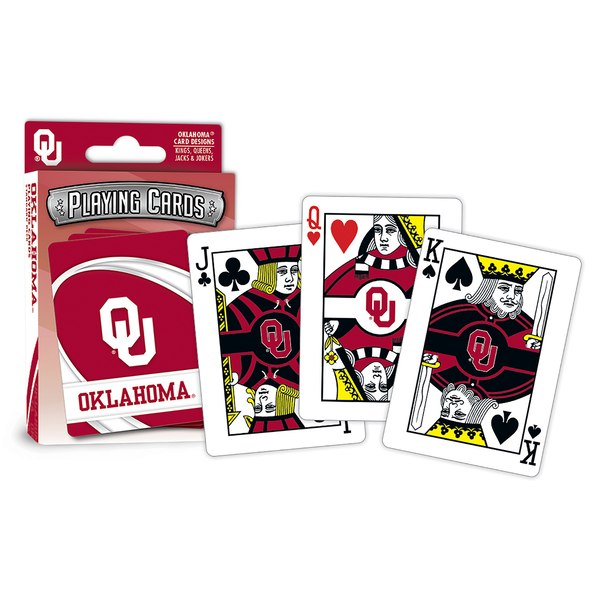 All face cards and Jokers have individualized team designs. Ace of spades has a special wood-cut college design. Printed graphics. Officially licensed. Brought to you by: Masterpieces Puzzle Company. Cards measure 3.5" x 2.5"
Oklahoma's original OU Sooner & Oklahoma State Cowboys store as well as Oklahoma City Thunder, Jordan Brand, Nike, Cutter & Buck, Antiqua, Under Armour, Colosium, Gameday Coutour and more. We carry the Official Big 12 Champion Gear and the National Championship Game winning tees.. Come by and see us in person. We promise you will not be disappointed! Copyright © BIG RED SHOP / BEDLAM ZONE. All Rights Reserved.